I once attempted to end an argument about religion in the making by blurting out that there was no such thing as cake and that there was only pie. Or was it the other way around? I think it was, actually. I'm more of a mind to defend cake. In any case, it was successful, as a jovial debate about the legitimacy of pie (or cake) ensued. 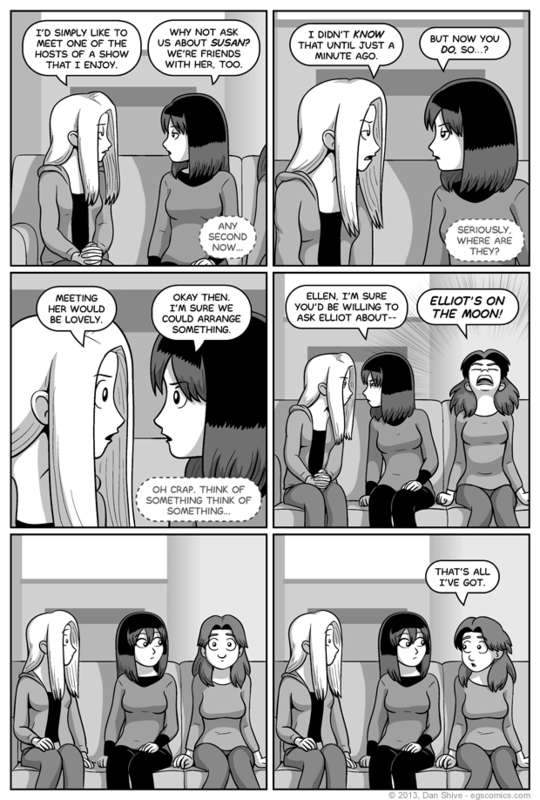 I bring this up in defense of Ellen's failed strategy in this comic. Sometimes, saying something truly bizarre can save the day. This was not one of those days. If I may critique her approach, the idea is to change the subject entirely, not make some excuse that cannot possibly be... Actually, in this comic, it probably would be possible for him to get on the moon somehow, but it's not very likely or true, now is it? In any case, keeping the subject on Elliot was a lot like summoning a demonic duck and then not doing anything. As for where the other guests are, Ellen should know better. Secondary characters know instinctively to wait patiently outside until the protagonists have had a chance to do everything they need to before they get there. It's just common sense.